Industrial Production (IP) surprised on the downside by falling 9.8% yoy in calendar adjusted terms in December (-8.4% BBVA Research vs. -7.5% Consensus). Thus, IP contracted by 7.5% in 4Q18 after its 1.6% growth in 3Q18. With this, our monthly GDP indicator (GBTRGDPY Index at Bloomberg) nowcasts a contraction of 2.1% yoy growth in December (with 96% info), which will bring the whole year GDP growth to slightly below 3% for 2018 (official data to be released on the 11th of March). The analysis of activity indicators show contradictory signals. In one hand, still negative intermediate goods production together with the broad-based worsening (despite the extension of tax incentives) signal further deterioration in the coming months, as confirmed by our nowcasting figures for January. Though, recent slow-down in credit correction and additional impulses could be supportive with a lag; while the loss of steam in exporting sectors could be a risk factor, given the continuation of sizable fall in intermediate goods imports and likely lower demand from Europe. All in all, we maintain our view that the recovery in economic activity could start as of 2Q19 and bring the whole year GDP growth rate to 1% in 2019. The monthly decline of 1.4% in IP (sca) revealed an additional broad-based worsening. Ongoing sharp fall in intermediate and capital goods production underpinned the concern on near-future production as the contraction accelerated to 11.7% and 7.2% yoy in 4Q18 from 1% and 0.6% yoy in 3Q18, respectively. In sectorial details, sizable worsening in manufacturing sector weighed on the general index, while especially other transportation (mainly defense equipment) production continued to prevent a further reduction in 4Q18. 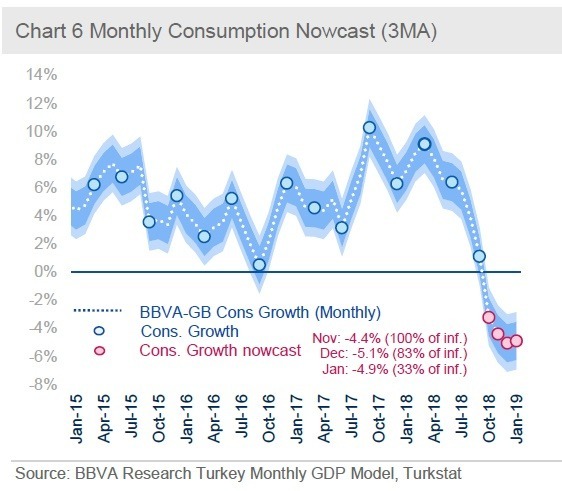 Our nowcasting demand subcomponents (see graphs 6-8) show that domestic demand continues to shrink especially on the investment side, while as of January some stabilization in consumption is observed thanks to the recent impulses. On the other hand, downside risks on the contribution of net exports are increasing as the economic activity in Europe is expected to decelerate further. Still deteriorating electricity production, weak confidence indices, ongoing retreatment in intermediate goods imports and diminishing effect of tax incentives weigh on activity, while recent supportive loan schemes to SMEs, households and retailers could be the buffers against further deterioration. The maintenance of sharp contraction in IP despite the extension of tax incentives, and poorer performance of exporting sectors could be the downside risks on growth. On the other hand, higher-than-expected minimum wage hike, recent supportive loan restructuring facilities and the slow-down in credit correction could provide some buffer with a lag. We expect GDP growth to decelerate further to 1% in 2019, assuming the recovery could start as of 2Q.